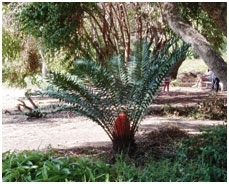 Are you interested in cycads or just looking to find unusual plants in Orange County? Try the Fullerton Arboretum where they have over 3000 plants and a couple dozen cycads. This is a cycad from the Zamiaceae family and is called an Encephalartosferox and is one of the many cycads you will find growing there.